The Divine Right of Capital: New Corporate Paradigm? Marjorie Kelly’s The Divine Right of Capital (link) offers insights in a readable style (favorably compared to Tom Paine by one prominent reviewer) and the beginnings of a viable alternative. After Enron, WorldCom and dozens of other frauds, the time may be ripe for a new corporate paradigm. Certainly, mistrust of the current system is at an all time high…at least during my 54 year lifetime. Instead of maximizing the return to shareholders, corporations should be maximizing total return…a concept we have been advocating here at CorpGov.Net since 1995. Total return here implies the long term efficient use of all resources, both natural and human. Of course, at the heart of the efficient use of resources is the need to recognize humanity as part of nature, not separate from it. The aim of The Divine Right of Capital is to start a dialogue about the “core problem of capitalism.” Bloated CEO pay, sweatshops, stagnant wages, corporate welfare, environmental indifference and, I would add, the unraveling of political democracy, are all symptoms. “They spring from a single source: the mandate to maximize returns to shareholders.” Kelly argues that “this mandate amounts to property bias, which is akin to racial or gender bias. It arises from the unconscious belief that property owners, or wealth holders, matter more than others.” We have yielded control to an economic aristocracy. Civilization has crossed a great divide in history, from monarchy to democracy. But we have democratized only government, not economics. Property bias keeps our corporate worldview rooted in the pre-democratic age. Corporations used to be chartered for social purposes, as well as to bring a profit to investors. Today they seem out of control. Too many are focused on pumping up the price of their stock, rather than creating real value. Most of the enormous wealth generated by corporations is channeled to a very small number of investors. Kelly points out that between 1976 and 1997 the top 1% doubled their share of household wealth in the US from 20% to 40%. Contrary to popular opinion (I wonder if most people really are this misinformed), “investing” in the stock market is really speculating; 99% of the money invested in stocks simply represents a bet on future growth. The stockholder isn’t providing capital to a company but is buying shares from another stockholder, gambling that the price will rise. Only about 1% of stock sold (mostly during initial public offerings) actually finds its way to the corporation itself. The vast majority of corporate capital comes from retained earnings, not from the sale of stock. A more accurate description of “investors,” according to Kelly, would be “extractors.” Most investors contribute nothing to the company. Instead, they are buying the right to extract wealth from it. Looking at the other stakeholders, such as suppliers and the community, one group stands out…employees. Employees and investors and present an interesting comparison. Employees typically invest a great deal in the companies they work for in terms of what Margaret Blair calls “firm specific human capital.” They develop knowledge and skills, much of which is specific to their individual firm’s operations. In addition, employees often have 401(k) or other investment plans that are overweighted in their employer’s stock. In contrast, most shareholders have a relatively small proportion of their investments in any one company because they recognize the reduced risk of a balanced portfolio. The fiduciary duty of directors is to maximize the wealth that can be extracted from the corporation by shareholders, typically in the form of dividends, buy-backs or increased share value. Fundamental to standard operating procedures is the idea of minimizing expenses such as wages and income to employees. Even though employees have a greater stake in the coporation’s success, they have no formal say as employees in corporate governance…no vote for the board of directors. Kelly argues employees are not treated as corporate citizens, in the current model, but as subjects. In today’s paradigm, you either own property or you essentially are property. Although we have made some progress in addressing racism and sexism, we’ve only scratched the surface of wealthism. There was Dorr’s Rebellion in 1842. But since owning property was largely abolished as a requirement for voting, the issues surrounding wealthism have largely gone unaddressed. Kelly argues the socially responsible investment movement, while in the right direction, doesn’t go far enough, since outperforming other investments is still the measure of success. In her vision, other measures matter…good wages, schools and a healthy environment. Wealthism is the key to many separate problems, just as sexism and racism are key in resolving many others. Kelly argues that efficiency is best served when gains go to those who create wealth. Indeed, almost all the studies I have read conclude that democratically run companies, where decision-making and profits are shared, are better at producing wealth than the typical corporate model, which more closely resembles a dictatorship. Diversity and democracy pay, but most of those who run corporations and many shareholders are not interested in creating wealth most efficiently. They are happy to settle for less efficiency, if it will disproportionately increase their own power and wealth. Kelly’s revelation that stock trading doesn’t raise corporate capital isn’t new. In 1967 Louis Kelso and Patricia Hetter wrote, “less that half of one percent of aggregate new capital formation during the eleven years 1955-1965 came from newly issued stocks, while 99.5% was financed through internal sources and through issuance of debt securities that in due course must be repaid from internal sources.” (Two-Factor Theory: The Economics of Reality. See also Democracy and Economic Power, Kelso, and his longtime ally Senator Russell Long, truly made a difference through the invention and popularization of employee stock ownership plans (ESOPs). Today, 8.8 million employees participate in 11,000 plans with assets valued at 400 billion. Want more information on how ESOPS can be made even more productive through employee involvement? Contact the National Center for Employee Ownership (NCEO). Create a Federal Employee Ownership Corporation to promote employee ownership like Fannie Mae and Freddie Mac promote home ownership. Require a majority vote of workers for mergers, acquisitions or hostile takeovers. Bar corporate felons from federal contracts. The Clinton administration enacted a rule to bar recidivist businesses with a record of breaking labor or environmental laws from getting government contracts. The Bush administration overturned it immediately on taking office. Kelly suggests the idea be extended to include a ban on campaign financing and lobbying for such corporate offenders. Reaffirm the right of the people to revoke corporate charters. 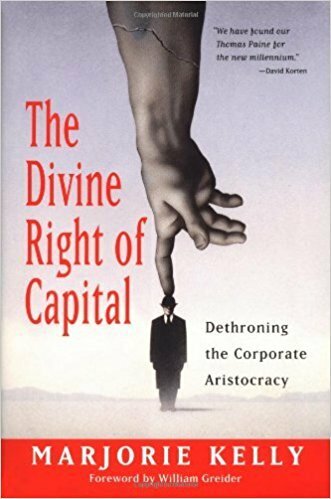 A word of caution; I’ve met corporate governance scholars who have read Kelly’s The Divine Right of Capital and refuse to even discuss it because the book doesn’t fit the current paradigm. I, for example, have spent years believing that if employees would just take more control of their pension funds, corporate executives would be held accountable to standards that more closely reflect our long term interests. Sure, 10% of the wealthiest families may hold 62% of the value of all pension accounts (they did in 1992), but many average Joes and Janes at least have some voice in how this money is invested and how companies owned by their pension fund are governed. Some, like the members of CalPERS, have a direct vote in elections for board members. Others vote for union officials who sit on pension fund boards or appoint those who do. Such votes aren’t in proportion to holdings, so pension funds tilt more towards democracy than traditional shareholdings. How do I reconcile Kelly’s vision with mine? We’re both headed down a road in the same basic direction to a more efficient model of corporate governance. No one has a monopoly on how to get there but working together should make the going a little easier for all of us. The Divine Right of Capital is highly recommended.